The NBA MVP claims that “nobody wants to play in Under Armours". Under Armour (NYSE:UA) (NYSE:UAA) shares are down nearly 60% in the past year, and NBA superstar Kevin Durant added yet another headache for the company after he mocked the brand on a popular podcast. During The Ringer's Bill Simmons Podcast, Durant declared that "nobody wants to play in Under Armours" and that the top kids "all play Nike (NYSE:NKE)". Durant went on to claim that the University of Maryland, which is partnered with Under Armour, is struggling to recruit top players who don't want to play in "an Under Armour system" since shoe companies have "a real big influence on where these kids go". The University of Maryland is often compared to the University of Oregon, which calls itself the "University of Nike". Investors are only growing more concerned with Under Armour's waning popularity and dependence on pricey celebrity endorsers. It's easy to spot the bias in Durant's claims, since he's one of Nike's top pitchmen. Under Armour tried to poach Durant, a Maryland native, three years ago after signing his teammate Steph Curry in late 2013. Durant rejected that offer, which included stock incentives and a community center built in his mother's name. But Under Armour was once called the "next Nike". Unfortunately, revenue growth has slowed and margins are contracting due to intense competition from industry rivals and retail bankruptcies that have flooded the market with excess inventory. Under Armour revenue rose 28% in 2015 and 22% in 2016, but analysts expect just 9% growth to $5.25 billion this year. That's a far cry from its prior goal of $7.5 billion in revenue by fiscal 2018 -- which would require 43% sales growth next year. 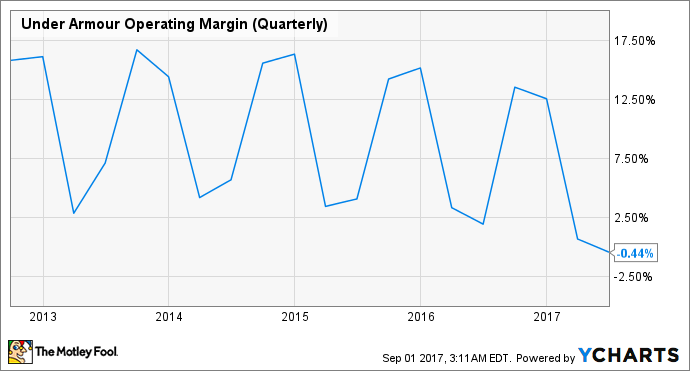 Gross margin also fell 190 basis points annually to 45.8% last quarter due to inventory management issues, foreign exchange, and higher shipping costs. Its operating margin -- throttled by rising marketing spend and investments in the direct-to-consumer and international businesses -- also dropped to negative territory for the first time in its history as a public company. That's why analysts expect earnings to fall 16% this year, compared to a 15% decline in 2016 and 10% growth in 2015. That also explains why both classes of Under Armour stock have plummeted recently. Under Armour relies on big endorsements and publicity to challenge the larger Nike and Adidas. However, those things can backfire in unexpected ways. Earlier this year, CEO Kevin Plank praised President Trump as a "real asset" to the country, sparking a fierce backlash among the company's top endorsers, including Curry, The Rock, and Misty Copeland. Plank quickly backtracked on his comments with a full-page newspaper ad, but the PR debacle sparked several analyst downgrades on the stock. And when Durant earned the MVP award instead of Curry after the Warriors' NBA Championship victory in June, Fortune proclaimed that "Nike beat Under Armour in the NBA Finals." That only served to reinforce the idea that Nike -- which is also endorsed by LeBron James, Kobe Bryant, Carmelo Anthony, and many other NBA superstars -- remains the preferred brand for the best players, while Under Armour is a distant underdog. Will Under Armour ever recover? Over the past few years, the weight of Under Armour's footwear business on its top line has gradually increased. That presents some challenges, because its footwear business has lower margins than its apparel business. Under Armour's Project Rock Delta shoes. Source: Under Armour. The company believes that the "premiumization" of its brand can offset these margin declines, since The Rock's Project Rock Delta shoes scored a high-end win for the company earlier this year. But that small victory couldn't offset dismal sales of the Curry 3, and Under Armour's recent partnerships with discount retailers Kohl's and DSW seemingly contradict that upmarket strategy. As the company struggles with its identity, industry rivals will only be putting on more pressure. Investors can only hope that Under Armour is able to restore its popularity and brand reputation to help fuel a turnaround for the business.